Here it is, W.i.P. Wednesday again. It's been a week of working willy-nilly on several projects at once. But progress is progress! Color Block Placemats -My first finish of the year! If you missed the post, here it is. Modern Blocks bee - Finished my block for this bee's first month here. Alisha is going to have one beautiful bliss-ful quatrefoil quilt! * For the Love of Solids Swap - signed up and waiting to get my partner! * do.Good Stitches January blocks - cancelled; taking a break in January . . . Linking up with W.i.P. Wednesday . . . I love your hometown quilt. And I have been wanting to do the Japanese + and X blocks forever! Yours look great! Super fun projects! I love those + and X blocks. You've been busy. Love the Hometown quilt. Should look amazing finished. Great projects loving the wild thing! Love your scrappy x and + blocks, so fun! Can't wait to see you start cutting your Modern Halves blocks, they are going to be great! Great looking projects! I agree with the addictive properties of the Japanese x and + blocks!! I can't seem to stop, and I'm only planning 5 for the swap! Your wild thing quilt is going to be great. 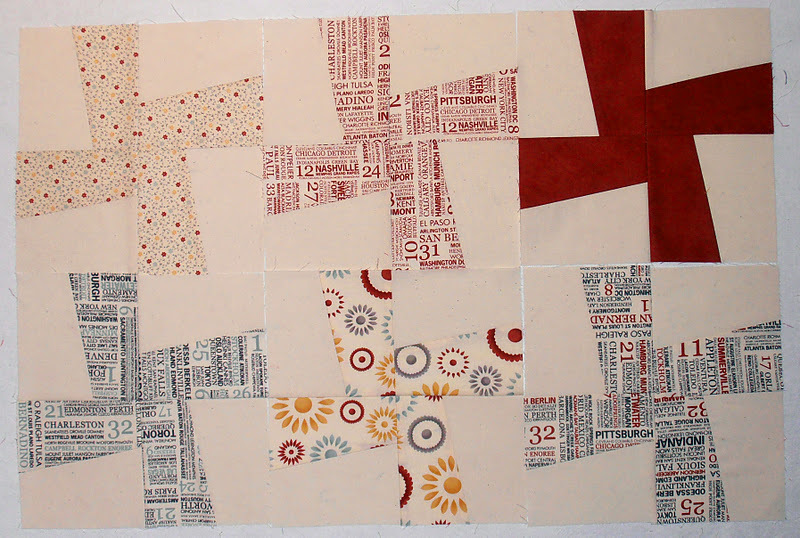 And I just LOVE how your Modern Halves blocks are coming along! I think the colors you use in your palette are amazing..they are so bright and happy...beautiful and congratulations on your finishes...which were once wip's. It's good to see progress made! Those are all so lovely, I can't pick a favourite. Oh Debbie, it all looks so great! You've really been cranking out those x and + blocks, wow! It's fun seeing my scraps in there. Wild Thing is looking great so far as well. Makes me miss Hometown! Love seeing all those x and + blocks one place and together, they look great! You've been so busy! Everything looks so lovely! Your Swoon blocks are what finally inspired me to do my own version. Mine is a Carpenter's Wheel but looks very similar! Love your x and + blocks. I have been working on them as well and I like them all. I love your half moon! 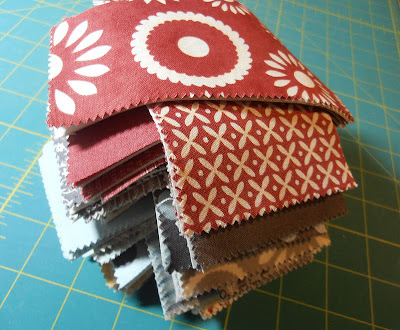 I was thinking about starting that and not sure about the scraps but love them. Nice work. 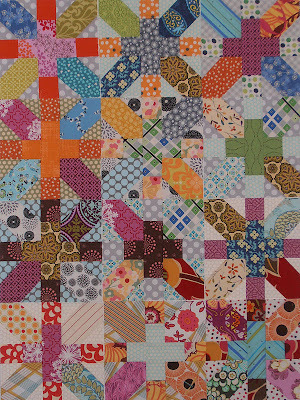 Oh, you are making me want to ditch my priorities and work on a + and x quilt!! Beautiful things going on here! i need a x&+ quilt. i love how scrappy and bright yours looks. 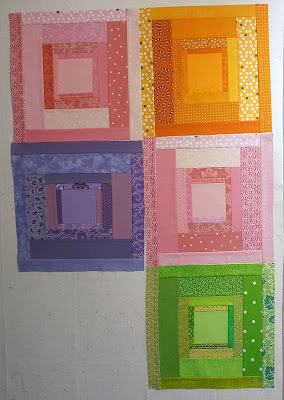 i need to make one of these blocks... today, well tomorrow, too busy today. Looks like you have had a fab week. Love all your stuff and the finsihed placemats are fantastic! You have been very busy. The hometown blocks look great and I love your x and+ blocks. I think I may have to try making them soon. Debbie, you are one busy woman! You are right - progress is progress. What amazing colors you've chosen for your projects! I've been admiring your x and + blocks on Flickr! They're fantastic. Your blocks look fabulous Debbie!! Oh I really love those + and x blocks - beautiful all together! Looking good, Debbie! If I had the extra time, I would have jumped in on the X and + swap. I love the blocks I have been seeing. I really like that 'On a Whim' pattern too. The aqua and white that they show would be perfect for winter.